Non-alcoholic fatty liver disease (NAFLD) is when excess fat builds up in the liver due to causes other than alcohol use. There are two types: non-alcoholic fatty liver (NAFL) and non-alcoholic steatohepatitis (NASH). Non-alcoholic fatty liver usually does not progress to liver damage or NASH. NASH includes both a fatty liver and liver inflammation. It may lead to complications such as cirrhosis, liver cancer, liver failure, or cardiovascular disease. The word is from steato-, meaning "fat" and hepatitis , meaning "inflammation of the liver". In nutrition, diet is the sum of food consumed by a person or other organism. The word diet often implies the use of specific intake of nutrition for health or weight-management reasons. Although humans are omnivores, each culture and each person holds some food preferences or some food taboos. This may be due to personal tastes or ethical reasons. Individual dietary choices may be more or less healthy. The Mayo Clinic is a nonprofit academic medical center based in Rochester, Minnesota, focused on integrated clinical practice, education, and research. It employs more than 4,500 physicians and scientists, along with another 58,400 administrative and allied health staff. The practice specializes in treating difficult cases through tertiary care and destination medicine. It is home to the highly ranked Mayo Clinic Alix School of Medicine in addition to many of the largest, best regarded residency education programs in the United States. It spends over $660 million a year on research and has more than 3,000 full-time research personnel. Chronic liver disease in the clinical context is a disease process of the liver that involves a process of progressive destruction and regeneration of the liver parenchyma leading to fibrosis and cirrhosis. "Chronic liver disease" refers to disease of the liver which lasts over a period of six months. It consists of a wide range of liver pathologies which include inflammation, liver cirrhosis, and hepatocellular carcinoma. The entire spectrum need not be experienced. Steatosis, also called fatty change, is the process describing the abnormal retention of lipids within a cell or organ. When not further specified, it is defined as affecting the liver. It reflects an impairment of the normal processes of synthesis and elimination of triglyceride fat. Excess lipid accumulates in vesicles that displace the cytoplasm. 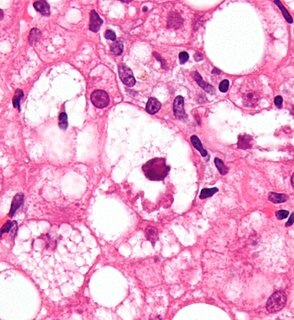 When the vesicles are large enough to distort the nucleus, the condition is known as macrovesicular steatosis; otherwise, the condition is known as microvesicular steatosis. While not particularly detrimental to the cell in mild cases, large accumulations can disrupt cell constituents, and in severe cases the cell may even burst. Hepatocellular carcinoma (HCC) is the most common type of primary liver cancer in adults, and is the most common cause of death in people with cirrhosis. Alcoholic hepatitis is hepatitis due to excessive intake of alcohol. It is usually found in association with fatty liver, an early stage of alcoholic liver disease, and may contribute to the progression of fibrosis, leading to cirrhosis. Signs and symptoms of alcoholic hepatitis include jaundice, ascites, fatigue and hepatic encephalopathy. Mild cases are self-limiting, but severe cases have a high risk of death. Severe cases may be treated with glucocorticoids. Zieve's syndrome is an acute metabolic condition that can occur during withdrawal from prolonged alcohol abuse. It is defined by hemolytic anemia, hyperlipoproteinaemia, jaundice, and abdominal pain. The underlying cause is liver delipidization. This is distinct from alcoholic hepatitis which, however, may present simultaneously or develop later. Liver biopsy is the biopsy from the liver. It is a medical test that is done to aid diagnosis of liver disease, to assess the severity of known liver disease, and to monitor the progress of treatment. Acute fatty liver of pregnancy is a rare life-threatening complication of pregnancy that occurs in the third trimester or the immediate period after delivery. It is thought to be caused by a disordered metabolism of fatty acids by mitochondria in the mother, caused by long-chain 3-hydroxyacyl-coenzyme A dehydrogenase deficiency. The condition was previously thought to be universally fatal, but aggressive treatment by stabilizing the mother with intravenous fluids and blood products in anticipation of early delivery has improved prognosis. Cirrhosis is a condition in which the liver does not function properly due to long-term damage. This damage is characterized by the replacement of normal liver tissue by scar tissue. Typically, the disease develops slowly over months or years. Early on, there are often no symptoms. As the disease worsens, a person may become tired, weak, itchy, have swelling in the lower legs, develop yellow skin, bruise easily, have fluid build up in the abdomen, or develop spider-like blood vessels on the skin. The fluid build-up in the abdomen may become spontaneously infected. Other complications include hepatic encephalopathy, bleeding from dilated veins in the esophagus or dilated stomach veins, and liver cancer. Hepatic encephalopathy results in confusion and may lead to unconsciousness. The AST/ALT ratio is the ratio between the concentrations of the enzymes aspartate transaminase (AST) and alanine transaminase, aka alanine aminotransferase (ALT) in the blood of a human or animal. It is measured with a blood test and is sometimes useful in medical diagnosis to differentiate between causes of liver damage, or hepatotoxicity. 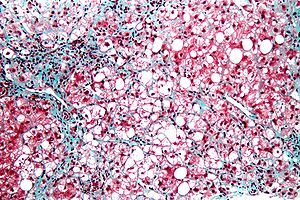 In histopathology, ballooning degeneration, formally ballooning degeneration of hepatocytes, is a form of liver parenchymal cell death. Obeticholic acid, is a semi-synthetic bile acid analogue which has the chemical structure 6α-ethyl-chenodeoxycholic acid. It is used as a drug to treat primary biliary cholangitis, and is undergoing development for several other liver diseases and related disorders. Intercept Pharmaceuticals Inc. hold the worldwide rights to develop OCA outside Japan and China, where it is licensed to Dainippon Sumitomo Pharma. Detlef Schuppan is a German biochemist and physician. He focuses on the diagnosis and treatment of coeliac disease and wheat sensitivity, fibrotic liver diseases and the immunology of chronic diseases and cancer. He is the director of the Institute of Translational Immunology and a professor of internal medicine, gastroenterology, and hepatology at the Medical Center of the Johannes Gutenberg University of Mainz in Germany. He directs the outpatient clinic for coeliac disease and small intestinal diseases. He is also a professor of medicine and senior visiting scientist at Harvard Medical School. ↑ "Alcoholic Steatohepatitis – Causes, Symptoms And Treatment" . Retrieved 21 Dec 2016. ↑ "Steatohepatitis and Steatosis (Fatty Liver)" . Retrieved 17 May 2016. ↑ Vuppalanchi R, Chalasani N (January 2009). "Nonalcoholic fatty liver disease and nonalcoholic steatohepatitis: Selected practical issues in their evaluation and management". Hepatology. 49 (1): 306–17. doi:10.1002/hep.22603. PMC 2766096 . PMID 19065650. ↑ Ratziu, V; Goodman, Z; Sanyal, A (April 2015). "Current efforts and trends in the treatment of NASH". Journal of Hepatology. 62 (1 Suppl): S65–75. doi:10.1016/j.jhep.2015.02.041. PMID 25920092. ↑ Adams LA, Angulo P (2006). "Treatment of non-alcoholic fatty liver disease". Postgrad Med J. 82 (967): 315–22. doi:10.1136/pgmj.2005.042200. PMC 2563793 . PMID 16679470. ↑ Veena J, Muragundla A, Sidgiddi S, Subramaniam S (2014). "Non-alcoholic fatty liver disease: need for a balanced nutritional source". Br. J. Nutr. 112 (11): 1858–72. doi:10.1017/S0007114514002591. PMID 25274101. ↑ Ludwig J, Viggiano TR, McGill DB, Oh BJ (1980). "Nonalcoholic steatohepatitis: Mayo Clinic experiences with a hitherto unnamed disease". Mayo Clin Proc. 55 (7): 434–438. PMID 7382552. ↑ Cassiman D, Jaeken J (2008). "NASH may be trash". Gut. 57 (2): 141–4. doi:10.1136/gut.2007.123240. PMID 18192446.